Remember when the Levi’s Air Jordan 4 Blue Denim pair dropped in January and someone bleached them? Well, that unique custom piece of footwear art will become a reality this June. Out of many hyped collaborations, Jordan Brand was not joking when they started the year off collab-ing with Levi’s. The shoe made it to our 2018 10 Most Heated Sneaks on the Resale Market list. And now the adventure continues as we get not one, but two pairs dropping on the same day. Owners of the Levi’s Air Jordan 4 have taken it upon themselves to stress their pairs. The goal is to make them look worn and torn because that’s when the shoe’s true beauty comes out. Online you’ll see people doing all kinds of things to their shoes, picking at and scratching with razors, and bleaching to give them a washed out look. All white like I got the whole thing bleached. Thanks for the assist on these @mattvaughan2112. Custom bleached @levis @jumpman23 IV’s. Although it sounds crazy to take such risks with your sneakers, customs have become a standalone industry. 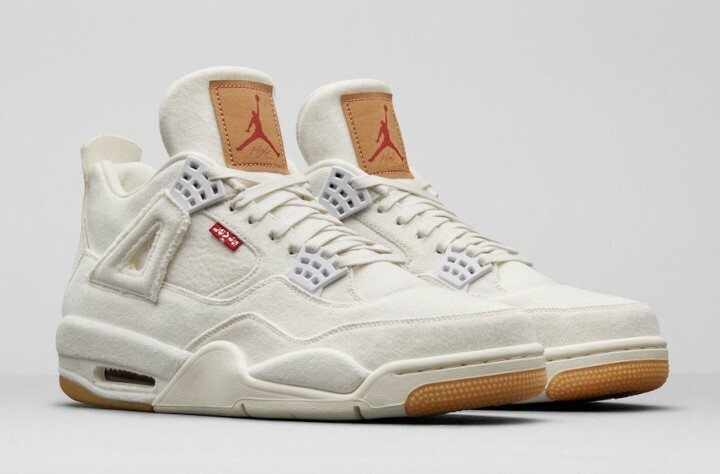 Instagram user @arab_lincoln created an all-white version of the Levi’s Air Jordan 4. And soon after, sneaker leakers began to announce the potential release of two new Levi’s Air Jordan 4 colorways. Surprise, the all-white pair is coming, accompanied by a black pair. Both are set to release on June 30. But while that’s not a 100% confirmed date, we hope to see the release take place as soon as possible. And hopefully, the NYPD doesn’t shut down the event like last time. In terms of resale value and worthiness, the Levi’s Air Jordan 4 is a big deal. The first denim version of these AJ4s is still selling for around $600, over six months later. In addition, backdoored white and black pairs of the Levi’s Air Jordan 4 are making a lot more on the aftermarket. The white pair is making just above $600 on StockX, while the black pair seems to be able to fetch a good $1000. So whether you’re in for a personal pair or to resell, the Levi’s Air Jordan 4 is your go-to sneakers this June. And after all that controversy about the Cream Whites and their stock level, you among other sneakerheads might think about switching to Jordans. But wait until you see the Butters also dropping in June. We think they’re gonna help bring back Yeezys’ hype alongside August’s Sesames. Raise your hand if you had no luck copping the Levi’s Air Jordan 4 in January. Well, you have two more chances this June, so come prepared for the win. And above it all, if you’re copping in-store, watch out because people could get violent like last time. Honestly, it’s safer to just cop online from the comfort of your own home, using a bot. The early links below can actually be very helpful. Other than Nike US and Nike EU, Solebox may hold an online release for the white colorway. The OG Jordan 11 Concord is Here for the Holidays. No L This Time!